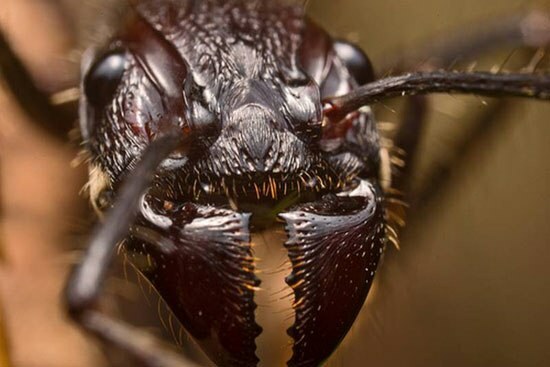 Imagine an ant so large it could tear your flesh. Now imagine an entire colony of them descending upon you in your sleep. You wake up almost instantly as the shifting weight of a cadre of insect killers disturbs your dreams. Terror creeps quickly as you come back to the terrifying reality. You brush off as many as you can, frantically running your hands over your arms and legs while stamping madly on the ground. But your feet can’t crush these resilient bastards. They regroup and circle around your position. This time they try and climb you from the back of your legs. This is how you die. Cold. Alone. Mutilated by a creature no longer alive in your native time. Now: be happy you didn’t live 50 million years ago, when these things really existed. Massive ants of this size have been found before but not in America. It remains a mystery how they arrived there. You are currently browsing the archives for the Ants category.